Over and over again, he showed them the basics of sword fighting and hit them when they failed to impress him. The objective was not only to motivate them to succeed but also to enrage them. During the sparring, when they lost control and tried to hit him, Blacknail simply countered using his vastly superior skills and then humiliated them. The point was to condition them to not give into their anger. The hobgoblins' violent instincts had to be suppressed, and Blacknail wanted them to know he was in charge. He was the leader, and he didn’t plan on stepping down or letting himself get killed. I bet we'll see a new evolution for Blacknail. He'll need it if he's going to get a lot more hobgoblins under his command. I'm betting on either him becoming a troll or becoming some sort of mutant. I don't think so. Probably he will learn his special effect of elixir. Maybe he will get better at fighting... But I don't expect another transformation. Neither of those. I base my theory on the Patreon tiers, which have changed now that I look at them again, but pretty much goblin related evolutions till he's right and royal. -Blacknail: character development has stopped. He's an unpleasant creature by any human standard. He has also somehow become the master of a slave chattel. Is there any reason to assume such a thing could actually function? Where in the animal kingdom can it be found? Even in human history it's very very rare. Goblins are supposed to be super dumb and super unruly, yet overnight they become extremely productive under the lash? -These goblins are supposed to have the IQ of a Neanderthal or worse. That's why their natural state is lower than hunter-gatherer. How can they learn so fast? How can any of them become almost fluent in English comprehension after a week or less? How has blacknail accumulated so many skills in less than a YEAR? He learned faster than a HUMAN could. -If the setting is 'western dark ages' then 99% of the population should be farmers, armies should be tiny, and conscription should be unlikely. Also, banditry should be very minimal relative to the normal population because almost everyone is at subsistence. There shouldn't be enough resources to support a lot of parasites. 1) I wouldn't call Blacknail unpleasant. He's just playing by a completely different set of morals then his human counterparts. And the goblins aren't so much slave chattel as they are subordinates under the standard goblin hierarchy. While it's true I'd like to see Blacknail learn more about people, we don't want to lose the goblin perspective that gives the novel it's charm. 2) Nobody ever said the goblins were stupid. They had complete societies of their own before humans came, and it wasn't until human colonists wiped them out that they were sent back to a feral hunter-gatherer technological level. Also goblins are supposed to be like children who are very good at picking up languages. While I agree Blacknail has learned many skills, things like rope making and setting traps are relatively simple and can be learned with a few hours of practice. His abilities as an assassin/sneaky fighter can be explained in that they mesh very well with his goblin instincts. We could also explain this by saying Blacknail is just very talented. In addition, most of his battles were won with cleverness. The fact that he couldn't beat the other assassin back in daggerpoint with a sword was what made Blacknail have to go to such extreme lengths to deal with him. 3) The setting isn't 'western dark ages' it's high fantasy, with magic, goblins, ogres, trolls, and those elf-ish people to the north. I'd say there are more parallels to the late eighteenth century colonists of North America than to the dark ages, just with firearms replaced by magic. Even if we're not going to explain the food surplus with magic, in medieval England 90% of the two million people lived in the countryside in about 13,000 towns, villages, and hamlets (Domesday, William the Conqueror ). Not the 99% you said. And keep in mind that not all of those 90% of people were farmers. Many of them worked other occupations manufacturing and producing goods. The variety of goods that Herad captured early on in the story lends more credence to the notion that the level of industry is closer to post-colonization but pre-industrial then it is to the European dark ages. Also before Henry VII banned private armies, infighting between feudal lords was seen as normal and legitimate. Over in the Holy Roman Empire, various princes did as they pleased and fought amongst themselves as nearly sovereign powers. Knights were the backbone of any army, but part of their duties as the best trained soldiers was to train up peasant levies to form the bulk of the fighting force. These were often serfs who were obligated to give a certain portion of their time to their feudal lord in lieu of rent. That meant they often found themselves pressed into their feudal lord's armies. I will however admit that I found it confusing that so many merchant caravans were passing north. It's not like there's anybody north of the human kingdom's to trade with. I don't think we have a map of the continent yet, but I would say the most plausible explanation would be that passing north allows travelers to bypass some mountains or rivers and head south again to another human kingdom. Perhaps ClearMadness could weigh in here with an explanation. I don’t mean to make light of your suggestions for the improvement of the story, but I just don’t see these as major issues. Edit: I apologize for the long comment. It didn't seem nearly so lengthy when I was typing it. 1. Yes, and his set of rules is unpleasant. I'm not sure how else you can evaluate his behavior, other than to compare it to what is pleasant behavior for a human. A goblin might have a different perspective, but that's irrelevant because WE are humans. The standard goblin heirarchy is basically slavery. Blacknail even explicitly calls his subordinates overseers, and enforces his leadership with violence! Then, he tells the human that if he tries to run away, or disobey orders, the guy will be murdered! If that is not slavery, I don't know what is. Goblin cognitive capabilities are obviously similar in kind/structure to humans, meaning they can grasp many of the same concepts. Humans obviously have many more insights into social structure than goblins, who have almost no social structure. Why can't blacknail recognize any of it? Saeter's explanation for why blacknail shouldn't menace Daggerpoint was the closest we got to that. The primary 'goblin' flavor seems to be basic cognitive dissonance. They love stealing things, and hate being stolen from and thieves in general, and reconcile the difference with word games. Similarly, they hate being abused and love abusing. Humans can and do do that too, so it's not very unique. 2. Complete societies don't require a human level of intelligence, and certainly regular goblins aren't much better than ~3-4 year old children in terms of development, no matter how much time passes. A human child permanently 3-4 years in physical development would quickly outstrip any goblin. The story presents them as being able to PEAK at that level. When Blacknail leveled up his cognitive abilities by transforming into a hobgoblin, he seemed to reach the capabilities of a 6-8 year old. 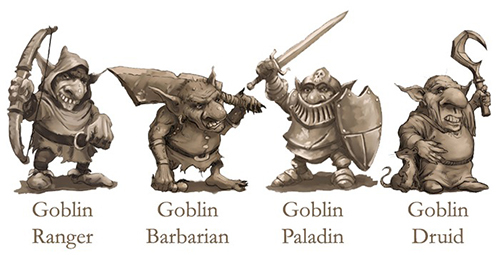 These comparisons aren't very good because the goblin brains are just smaller than humans. Good evidence of this is an apparent lack of curiosity among goblins. Since the tribes we have seen live in periodic contact with humans, we should expect them to imitate human behavior. Instead, the most we see is makeshift weapons and shelters. Where are goblin tools? They can't even make fire. Despite this, they somehow learn new skills and comprehend their usefulness very quickly in the story. It's simply inconsistent. I feel the author was very sloppy in how the most recent goblins learn English. Some of the grammar and vocabulary used is very complex, not easy to learn in just a week or a few days. Intelligence and cleverness go hand in hand. Blacknail has a very unusual amount of cleverness compared to the general incompetence of his race. This is obviously a plot tool so the story isn't extremely boring. 3. My main point is that Blacknail's companions are improbable, and that the notion of a bandit king is equally improbable, especially considering most of the bandits are just regular people trying to escape enslavement and death. 1) If you’re looking for a white knight protagonist that helps people in need, abstains from violence, and selflessly cares for others then you’re reading the wrong type of story. Yes Blacknail uses violence to compel obedience, but didn’t Herad do the same thing? I’m not going to argue human morals with you because that’s not the point of the story. The appeal of this fiction is that it is written from the perspective of a goblin, so if you’re saying that’s irrelevant because the reader is human you are missing out on immersion and the whole point of the story. Blacknail doesn’t recognize finer details of human social etiquette because he’s relatively new to human society and with a background in goblin social etiquette some human proclivities just don’t make sense. As for their behavior, goblins grow up in a very primitive society (at least the settings modern goblins have). What we have is a multi-generational ‘Lord of the Flies’ scenario, where civilized beings have devolved to the level of might makes right. That means stealing and abuse are commonplace. This is not very different from humans, as archaeological evidence from various dig sites (Specifically the Etruscan site in Italy) tells us that the primary method by which humans in antiquity rose in social status and wealth was by attacking and stealing the goods of nearby settlements. Modern psychologists have found that even modern humans will act this way given proper circumstances (See the Robbers Cave study). 2) You are making false equivalences based off assumptions about the nature of goblins in this setting. Nowhere was the size of a goblins brain mentioned, and never were there any direct comparisons between this settings goblins and human children of any ages. Even if that were the case goblins would have a level of intelligence far beyond what a 3-4 year old is capable of. Scamp and Imp both had a relatively firm grasp on language as goblins, and Blacknail was capable of feats as a goblin far beyond what you could expect of a 3-4 year old child who has only learned to walk and talk. Blacknail was setting snares, on the lookout for danger and able to avoid it, able to express sympathy for Saeter’s melancholy behavior when he realized Herad might become queen of the north, ect. At the age of 3-4 a human child is totally dependent on its parents for food and protection. A goblin is not. As a hobgoblin, Blacknail is capable of as grammatically correct human speech as his physiology and desires allow. He creates tools, traps, weapons and succeeds in successfully tricking multiple human professional guards and assassins. Could an eight year old child break into a gang leaders hideout, kill their leader, and escape? Trick professional assassins into pursuing him into the woods, where he had prepared traps beforehand? 3) Bandits were not at all uncommon in the middle ages. The following is a quote from Edward I of England from the 13 century. During the hundred years war in France there were a large number of “free companies” ranging anywhere from a dozen to several thousand men. Their recruits came from the rapidly deteriorating French society, and the banded together pillaging towns and eventually setting down in an area where their leaders would rule like sovereign princes. Look up the Routiers. Similar occurrences have been recorded since before the time of Rome. Bandit kings were not only possible, but in fact a fairly common occurrence throughout history. There are still several large cities in the North. They are protected by large walls and armies so they haven't been hurt to badly by bandits, except indirectly. These cities do a lot of minning, blacksmithing, and forestry. Not all of the North is overrun either. Its a large place and it varies from country to country. 1. I'm not looking for an incredible character. I'm looking for a reason to be interested in the character, and his character development leaves him unpleasant at this point in the story. Originally he was interesting by virtue of being a goblin and having a unique perspective/experience. But, his perspective did not gain anything from being in contact with humans other than awareness of a bigger world, and some bizarre encounters with clearly human experiences. He was not made more pleasant by learning even basic social mechanisms, his unique experience was sullied by things foreign to his race, and now he's on a damn revenge quest. 2. I am making analogies not equivalences. Most evidence points to goblins being quite dumb relative to hobgoblins, and hobgoblins maybe and maybe not being on par with humans. The lack of human imitation is a big red flag. This is inconsistent with how quickly they learn new skills when taught, and how fast some have picked up a new language. 3. You seem to have a better grasp of history than me, so if what you say is true then perhaps the setting here is plausible. A different problem, however, is how many rabbits they seem to eat.. How are local rabbit populations not hunted to extinction whenever Blacknail is around? 1) I was discussing this topic with somebody else on the discord chat and they brought up the fact that you can’t really say character development has stopped because the story isn’t finished yet. And I would say his perception of the human world has changed dramatically as the story has progressed. Starting in daggerpoint, Blacknail has repeatedly saved the lives of humans he considers to be part of his ‘tribe’, including Khita, the guy with her, and everyone he took Into the Green, which can be considered sympathetic human-like behavior. In addition, Blacknails current disposition towards primal practicality adds humor to the narrative, which increases entertainment value. 2) Blacknail has imitated humans where he sees behavior worth imitating. The goblins picked up the sling because it is obviously useful, and Blacknail saw the value in learning the bow even though he wasn’t good with it at first. Hunting with traps was also something Blacknail starting doing. But you can’t expect goblins to start picking up reading when they’ve seen no obvious use for it (Though Imp soon might). And the goblins copying human mating rituals would be very strange indeed. That being said, I will admit that it is unusual that the snares are used for exclusively catching rabbits. That could be explained by saying the snares are only designed to catch rabbits, but an experienced hunter like Saeter should know there is other game to be had in the woods. Where are the pheasants, hares, geese, and quail? Also, the lack of squirrels being eaten in the story disturbed me. Squirrels are all over the world, and they’re not too hard to catch. A determined goblin could probably catch one with their bare hands. I’ve done it myself, though it took a lot of patience. They weren’t that uncommon a food source back in the day, though they’re a little small for a human. Also, archeological evidence indicates that one of the first animals ever herded by early humans were snails, which would make perfect goblin food! They are easy to keep because you can just feed them bits of scrap and dig a trench around them to keep them from escaping. They’re easy to breed and reproduce rapidly. They’re a perfect, simple snack for goblins to begin raising! 1. It seems like blacknail is evolving to become human-like, which is frankly unappealing considering a market saturated with fictional non-human humans. He experiences things like fondness, sexual tension, respect and admiration, grief, that no other goblin seems to be familiar with. Are goblins just sub-humans? By character development I'm referring to a sort of social wisdom. While he has been getting better at identifying the motivations of other people, that is just a skill. There is no evidence he's on the road to comprehending principles like the golden rule, or the productivity value of individual autonomy. 2. Almost all skills demonstrated by goblins were originally taught by humans. Saeter taught blacknail a bunch of stuff, who taught other goblins the same stuff. Only Imp seems to have curiosity for learning new things. Blacknail even SAYS that is unusual for a goblin. If goblins had cognitive abilities similar to humans, they would tend to get bored very easily with their basic existence, and find human activity very interesting because of how much mental energy would be required to observe them. They would also have a lower time preference, ie a tendency to plan for the future. Instead, goblins are child-like in their focus on immediate gratification. There is a weird contradiction between typical goblin nature, which blacknail makes many comments about, and the feral goblin tribe behavior after blacknail teaches them how to do stuff. Goblins don't plan for the future, are extremely self-centered, and tend to fight a lot. How can a tribe of creatures like that be transformed into a productive community in just a couple days? I would believe it if blacknail spent a few chapters dealing with problems and developing new social norms, and if there was a much larger time lapse. It could have been an interesting project, but was instead glossed over because slavery just works on goblins so well..
3. Yeah it would be nice to have some diversity in blacknail and his companions' food acquisition.